Weighted Blankets - Gravityblankets UKBlogWhat Happens to Your Body During Sleep? Theses on passivity during sleep have already been refuted a long time ago. When we fall asleep a number of regenerative processes take place in our body. Our cells renew, growth hormone is produced and a very important body repair processes are activated. What is more, at that time the brain starts to organise and put together all the collected information. What exactly happens to the body when we enter the sleep stage? Sleep medicine mentions five stages of sleep – awake, falling asleep, light sleep, deep sleep, and finally the REM sleep, i.e. dreaming. Together they constitute a cycle of about 90-100 minutes, followed by a short unnoticeable awakening. After that, another sleep cycle begins. Adults go through from four to six such sequences during one night. In the first stage, also called NREM (non-rapid eye movement), body temperature drops, heart rate slows down, breathing regulates, kidneys produce less urine and muscles relax and become less tense. At that time, usually in an hour after falling asleep, we enter the deepest sleep when the most effective rest takes place. Numerous skin changes occur in the subsequent stages. The tissue becomes firm and cells undergo regenerative processes. Growth hormone and cortisol are also released. The former is responsible for the renewal of the epidermis while the latter takes care of the inhibition of inflammatory processes. After the first stage, we start to dream, our breathing becomes faster and blood pressure increases. The working of the brain during sleep is also an interesting subject of research. Matthew Walker, the author of Why We Sleep, compares sleep activities to psychotic states. At that time, we see things that do not exist so they are hallucinations. We also have delusions as we are confused in time and space. We experience violent emotional states and often do not remember the greater part of our dreams, which can be compared to amnesia. Walker also believes that if any of the symptoms would happen to us awake, we would be referred to a psychiatrist for appropriate treatment. Fortunately, this is a normal process of our brain that occurs while we are resting. First of all, in the REM stage, all the information we have been lately coping with are sorted. The brain creates a catalogue of memories and finds connections between past situations that we have not noticed before. That is why, we are falling asleep with a problem and in the morning we wake up with our head full of ideas for solving it. The popular saying “Sleep on it” seems to have its reasonable justification. During sleep our brain undergoes therapy – we gain certain distance to problems and traumas, which is why in the morning we often feel cleansed of bad emotions. Depending on our location we need 4 to 9 hours of sleep a day. Normally seven hours is enough for the necessary regeneration processes and activation of our brain. However, there are people who, despite being very tired, are unable to enter any stage of rest. Today it is said that even half of the population, including children, is struggling with this problem. If you keep suffering from insomnia despite following all of your doctor’s recommendations, it may be worth thinking whether your subconsciousness is asking for safety signals. Often subconscious anxiety, frustration and a multitude of stimuli interfere with the proper functioning of the nervous system by sending information about the state of emergency to the brain. Appropriate sensory bedding may be a solution in such situations. 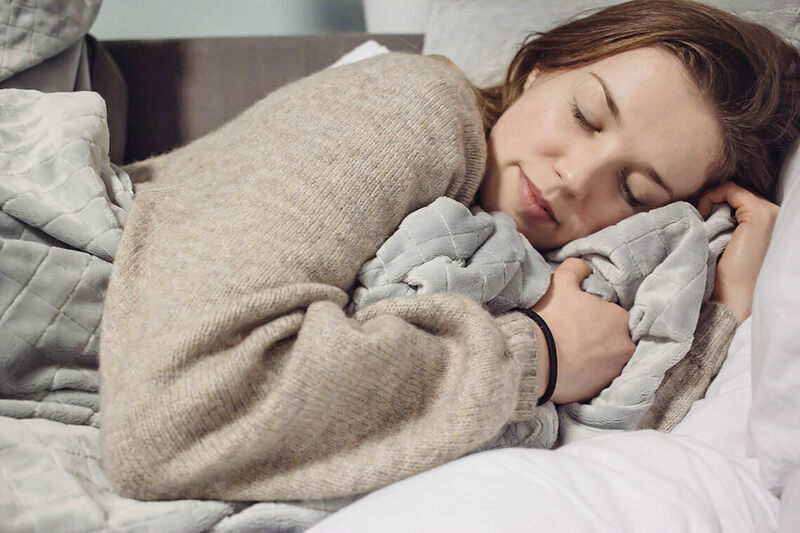 According to psychologists and psychiatrists, a quilt, blanket or pillow with loaded filling significantly improves sleep quality and has a soothing and calming down effects. Particularly visible changes in sleep quality were observed in young children using sensory bedding. Let`s not forget that sleep affects every aspect of our live and offers solutions to many vital problems. As it turns out, it is not the time but rather the sleep that heals all wounds. Why not make a proper use of it? In the end, all you have to do is just… go to sleep.